Google+ Raising a Trilingual Child: Question from a trilingual parent, who already raises children bilingually and would like to add a third language. Question from a trilingual parent, who already raises children bilingually and would like to add a third language. This question came from a trilingual parent, who would like to pass on both of the languages he speaks fluently besides the country language. The children have been raised bilingually. When would be the right time to introduce the language? Languages in question are English, Spanish, and Portuguese. I have a question about raising trilingual kids. I live in America so the common language is English. Grandparents, cousins, aunts and uncles (One uncle speaks Spanish) all speak English. So my wife only speaks English. I am fluent in Spanish and Portuguese. My oldest daughter is 2 1/2 and I have only spoken Spanish to her since birth but English to everyone else. She understands everything I say, but still tends to respond in English unless I push her to respond in Spanish. I now have a 1 year old boy. Same thing, I have only spoken to him in Spanish his whole life. He doesn't talk yet, so not sure how much he gets. I would really like to teach them Portuguese as well, but am not really sure how to do this. My wife is convinced that If I speak to them in Portuguese as well, it will confuse them. I considered speaking to my son only in Portuguese and my daughter in Spanish, but don't really know what to do, so I haven't done much. Suggestions? It's not too late I hope. As a multilingual parent myself I share the same wish with you and would like to pass all the languages I know onto my children; however, this is hard to do alone in predominantly monolingual environment. The community language influence is so strong that some parents, who are the only source of language input, have a hard time bring up bilingual children and pass on their mother tongue, not to mention raising them multilingually. That said, I think you have a greater priority now. Considering children's age and what you write about the language situation I would shift the priorities from adding a third language (Portuguese) into supporting and developing your children's Spanish. I’m not saying that you should not do anything in Portuguese. You could provide a limited input in that language, that would help to built a base for the future language learning. Make sure your bilingual children reply to you in Spanish all the time. Since you speak the community language, it is almost given that the kids will try to speak it to you too. Do not take it personally, even my fully bilingual child tried doing it in indirect way. He was addressing his community language speaking dad, when in fact he wanted to speak to me. He knew I listen and understand what he says. What I did : I just forced myself not to listen to him and always asked what did he say to his dad or to others. I still use this technique. Be proactive in developing your child’s vocabulary. (Read about it here.) Talk to your little child, explain what you see around and read books. Nothing builds child’s vocabulary better than books. Read How to read to a baby? Advice for parents. if you need some help to get started. Speak Spanish to your children even in public. Help your children to choose Spanish as sibling’s language. I am not sure if you realize that you have a unique opportunity for language development. If your daughter chooses Spanish as the siblings’ language, the kids will have endless possibilities for language practice. The older children are, the less they want to stick around you and the more they want to be with their friends. My kids, who are 3 and 5 years old, come home and want to play with each other. Although they like reading books so much, the only thing they want to do is to be together and play. Here is another article that can help you: 7 facts that can determine the language spoken between multilingual siblings. Bring your bilingual children in direct contact with Spanish speaking people. I would look for other Spanish-speaking parents near where you live. If you do not know anyone and have difficulties finding other families, try to enter your data in the Playdate finder. Also I would set a goal to travel with your children to a Spanish speaking country at least once before your older child’s 5th birthday. Remember that there are also areas and communities in the US, where Spanish is widely used. It should not be hard to find someone who speaks Spanish locally. Can you start speaking Portuguese now? Yes you can; however, since you did not start speaking Portuguese to your older child from birth I would hold on to it until she/he starts speaking well in one of the languages - English or Spanish. I would slowly introduce Portuguese to both kids through activities, music, cartoons. You could also use time and place language strategy and switch between Spanish and Portuguese every other day or week. Read more about it on the Language strategies page. Just keep the expectations according to the level of your language input. To finish, I would recommend you also read this article: Bilingualism and speech delay. How can you help? I am sure, if you come up with a plan and stick to it, you will be able to pass on both of your languages and your kids will become trilingual. Good luck! And let me know, if you have more questions. Click here to get notified when a new post in the Question and Answer series goes life. Are you bringing up a bilingual or multilingual child or are you a parent to be and have a question? 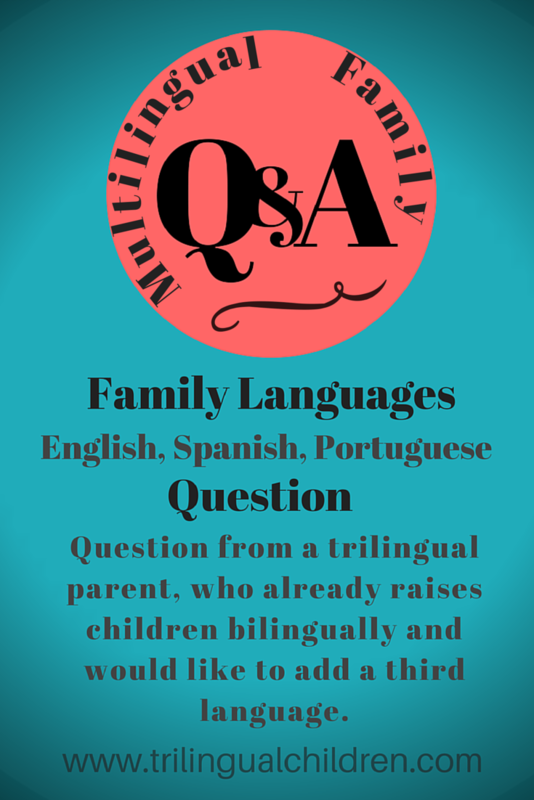 Read other parents questions and my answers in Multilingual Family Q&A Series. For privacy protection I can change your name and omit some personal details, if you wish. 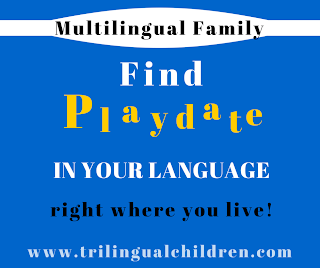 Are you a multilingual family and looking for a playdate in your language? Click here to find it now! Multilingual Family Interview: When your home languages are different from community language. Resources for Teaching Phonics and Reading to Children. Life Story: Trilingual mama - trilingual kid.Why would it be any other way?